Claymore is a 26 episode Anime series released in 2007. The first 24 episodes was based on this first 11 volumes of the Manga Series but the anime version used a different ending. 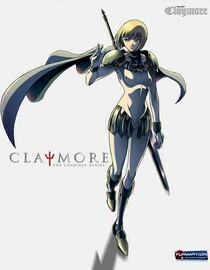 Claymore is actually the name of the organization that hunts Yoma or demons. Claymores are feared because they are part Yoma which would enable them to battle those beasts. They are a band of silver-eyed blonde females, they are feared by the human population because eventually their Yoma side would Awaken and they will become the thing that they fight. The heroine is Clare, years ago she was taken into the custody of the number 1 fighter of the organization, Teresa. But after Teresa slaughtered a band of bandits to save Clare, she was marked for death by the organization because their #1 rule is to protect humans and to hurt them in any way much less kill them require the most severe punishment. Death. Teresa fell in the hands of a fellow Claymore, Priscilla, who Awakened at the end of the battle. This altered Clare's destiny and became a Claymore herself, hunting down Priscilla to exact vengeance for Teresa's death. With Naruto being an exception, I'm not much into anime but this one was actually good and it's short, you can watch all episodes in Netflix on a lazy day. The story is figurative, fighting our inner demons to the best of our ability and doing what's right for the greater good. Typical of an anime series, the characters are interesting and have super human abilities. I can't help but admire Japanese creativity and it's no wonder why they have such a loyal following and why some prefer their animation more than a live action movie or even their digital counterparts. The series has an open ending although there's no news of the anime having another season. The Manga series is still ongoing. Claymore is a anglicization of the Gaelic claidheamh mòr "great sword". It's a Scottish two-handed longsword with a long hilt that was used by guards during the 15th to 16th century.